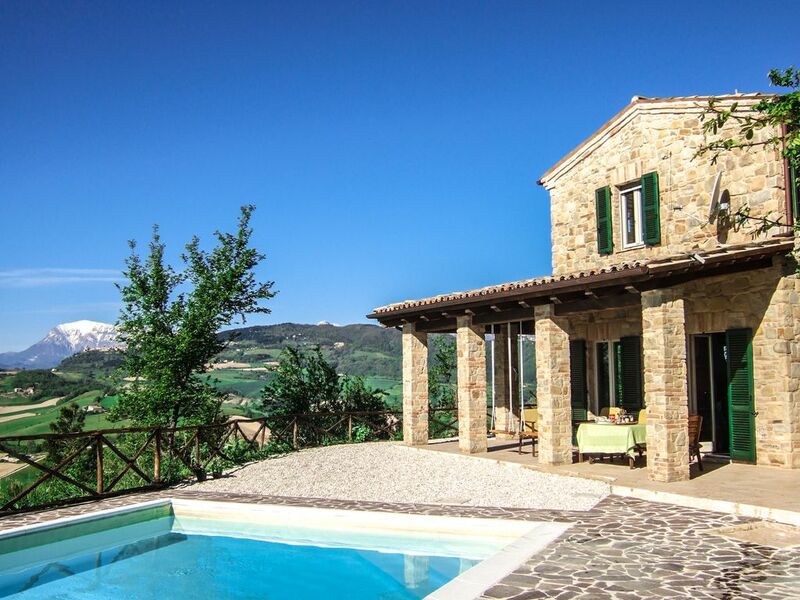 Casa Rosi is a beautiful cliff side villa in a wonderful position with spectacular 240º views from the sea to hilltop villages backed by the Sibillini Mountains. Whilst offering complete privacy and tranquility this perfect Italian holiday retreat sits within the conservation area of the medieval village with shops and restaurants only 5 minutes stroll away. Good beaches and mountain walks with wildflowers, both within 40 mins. Six sets of French doors open onto two shaded loggias with dining tables, chairs, swinging seat, swings and hammocks. One loggia overlooks the secluded and private salt water pool. The access road is private providing a very quiet stay with no passing traffic or pedestrians. A dream come true! Always wanted a house in Italy - it was only in later years we could afford it. We looked in Umbria and Tuscany; with no joy - too many tourists and too expensive. One year, the day before we left for home,we chanced upon Ascoli Piceno - amazed by glorious squares and Caffe Meletti we went straight into the first estate agent. An Italian friend says Le Marche people are the kindest & we agree. It took 6 years to find a site with an amazing view in a village & build a house with a pool. We owe our good fortune to the village - Santa Vittoria - and the people who helped us find the site. There it is - up its own wee drive - our dream come true. Ciao. Santa Vittoria is such a pretty village and the villagers are friendly and welcoming to visitors - tourists are not too numerous. The views from the property are outstanding. It took six years of searching in the area before we saw the house and it was an immediate decision to buy as the site was ideal. Casa Rosi is a new build on two floors in a traditional style with plenty of accommodation for six people. Being so close to the village is a real plus as it means guests can just walk into the village centre in less than five minutes where there are two restaurants as well as a baker, bank with ATM, chemist, two grocers, greengrocer, butcher and two cafes. Plenty of kitchen equipment and storage including mixer/ blender, cookery books etc. Garden ground on a steep slope, flowers and fruit trees surrounding property. Logia on two sides of the house with tables and chairs, swinging seat, installable hammocks and swings. In winter there is skiing in the Sibillini Mountains about 20km from Amandola with a variety of runs when the weather is suitable. There is a free tennis court owned by the village - the net can be obtained from the very small cafe near the main church - rackets and balls in our store room. Fly screens on all windows upstairs, full double-glazing. As this is a hilltop property with steep banks, the grounds children under 5 unless must be carefully supervised. Also the pool is close to the house and not fenced off, consequently not suitable for unsupervised or non swimming children. Eight substantial loungers, locally crafted hammocks, swinging seat and plenty of seating for eating outside. Games including a large set of jenga, boules, hoopla etc. Utility Room: Off the kitchen with large fridge/freezer, washing machine, ironing board and worktop with extra storage, wine rack and firstaid kit. Cleaning / Towels / Linen / Maid service: All bed linen and towels are provided but guests should bring their own pool and beach towels although beach towels can be arranged if requested. Towels and bed linen are changed once a week together with the cleaning of the house. Other: Large cloakroom with WC. Boiler room with drying pulley and outside equipment storage space. Pedaso is the nearest beach with seafood restaurants approx 40 mins drive, with sandy beaches at the more sophisticated beach Porto San Giorgio just a few minutes more. Fishing in Lago di Fiastre or snorkle over submerged village. At Norcia there is kayaking thro' gorges, rafting etc (tel. 3387678308). There are many lovely walks with wildlife and flowers in the Sibillini National Park (maps and details in the bookcase). The closest airport is Ancona, 75 min drive from the villa. Ryanair flies out of London Stansted daily. Ryanair also flies from London Stansted to Pescara, 90 min drive. BA fly from London Gatwick daily to Bologna and Ryanair from Edinburgh to Bologna twice a week. Many airlines fly to Rome which is 4 hrs drive from the villa. Our agent can pick up and return Ancona/Pescara for a fixed fee. There is a regular bus service to Rome from Amandola. Servigliano 10 mins. Monte san Martino 20 mins. Amandola 30 mins. San Ginesio 35 mins. Roman Urbs Salvia 40 mins. Santa Vittoria is a charming, lively and historic village with about 1500 inhabitants - it is off the beaten track so tourists are not numerous and are welcomed. There are three small grocers, a baker, a butcher, fruiterer, post office, bank, pharmacy, cafes and 2 good restaurants within 5-10 mins walk of the house. Round and about there are numerous hilltop villages within a few minutes drive - many with weekly markets - Servigliano has a market every first and third Monday in the month. A little further away are the old hilltop towns of Fermo with a lovely main square and associations with Thomas a Becket and Macerata with shops and its summer opera season. The provincial capital of Ascoli Piceno is a very beautiful and interesting large town about one hour away with Roman remains,good shops, medieval streets, riverside walks etc. Urbino with its Ducal Palace and Assisi make excellent day trips. Changeover Day: Changeover day is normally Saturday however in certain circumstances this can be flexible. Property should be vacated by 10am and new tenants should not arrive before 4pm.